There's always room for a bowl of pasta. Especially at Maialino. Photo by Pavia Rosati. Gentedimontagna founder Pavia Rosati weighs in with her list of favorite New York City restaurants. NEW YORK CITY – We're an opinionated bunch at Gentedimontagna HQ, which you probably already knew. And we take our food very seriously, which you also probably already knew. I don't think we've debated anything as fiercely as the 2016 edition of Gentedimontagna's Favorite New York City Restaurants. Compiling the list was a delicate balancing act: Which restaurants will be interesting for first-timers as well as regular visitors? Which will showcase the breadth of culinary diversity Manhattan has to offer? Which will walk the line between of-the-moment exciting and reliably reliable? We made that list, and it hit those marks. This list, on the other hand, has one single, selfish criteria: Where do I love to eat? A word about these very subjective choices: Yes, I love Italian. No, I don't love Chinese. And, yes, I do only eat downtown. My unapologetically biased list includes chefs I respect (George Mendes, Nick Anderer, Andrew Carmellini), dishes I always order (short rib at Upland, turnips at Vic's), dining rooms that remain magical decades after I first crossed their thresholds (Odeon, Odeon, Odeon), and places I'd frequent more often if I wasn't such a dedicated home cook. There's nothing Indian, Korean, or Lebanese — cuisines I regularly crave. Because while I've found restaurants I like, I haven't found any I love. Here's where I'll send you if ever you ask me, "where should we go for dinner in Manhattan?" "Nothing bad can happen when you start the day at Balthazar" is one of my New York City mantras. This is also the place I love to come for what-the-hell champagne at 3 p.m., for short ribs in the wee small hours, and for a warm embrace me when it's snowing outside. Exquisite food in a relaxed setting from an incredible trio: Drew Nieporent, the godfather of the NYC restaurant world; John Winterman, an amiable and bawdy host; and Markus Glocker, a creative and flawless chef. My local, and the place I'm most likely to go for breakfast meetings or dinners with friends visiting from out of town. Probably the ultimate West Village casual restaurant — relaxed, friendly, and quietly full of bold-faced names. I was sorry that Pulino's didn't last because I loved the pizza, but I also love Keith McNally's conversion of the pretty and airy Bowery spot. After a particularly disastrous meal at Dirty French, my friends and I raced to Cherche and begged them to give us a meal to make it all better. They did, as they always do. A neighborhood joint that knows what it believes in. Clam dip with potato chips. Clam chowder. Fried clam and lobster sliders. Chef Mikey Price has a one-track mind, and I'm riding on it. Many moons ago, I had long conversations with Carlos Suarez about his plans to open , his clubby and beautiful West Village restaurant. In the years since, he's blossomed into an elegant restaurateur whose three spots are warm, welcoming, and lively, none more so than his Provence-inspired Village spot. When I'm craving easy, unfussy Italian in the neighborhood, I come here for eggplant parm, cavatelli with brown butter, and fennel/celery root salad. Always consitent, always hits the spot. I admire this East Village standby for its subtle power. The market-driven food is always a home run, though chef Marco Canora will be the last one to brag about it. Brisket! Spare ribs! Dry rub! Corn bread! I always wish I had an extra stomach when I'm here. When I first walked in off the Bond Street cobblestones a few decades ago, the space was a furniture store that occasionally served salumi, cheese, and bread. Clearly, owner Donna Lennard was meant to be a neighborhood restaurateur, as she proves not only here but also at a block away. Spaghetti for everyone! A reliable neighborhood favorite, where my dream meal has me and a smart dining companion seated at the corner of the bar sharing a big bowl of pasta with inventive toppings and an interesting bottle of crisp white wine. I grew up in an Italian-American neighborhood, but I don't think I liked a meatball until I tasted Joey Campanaro's sliders. And that's just the beginning of what he does with humility, grace, and warmth that you can feel in the room and on the plate. Chef Andrew Carmellini is a renaissance man whose every move impresses me. In addition to holding sway over a local empire that includes Frenchie and vegetable-driven , he's a ridiculously talented musician and composer. 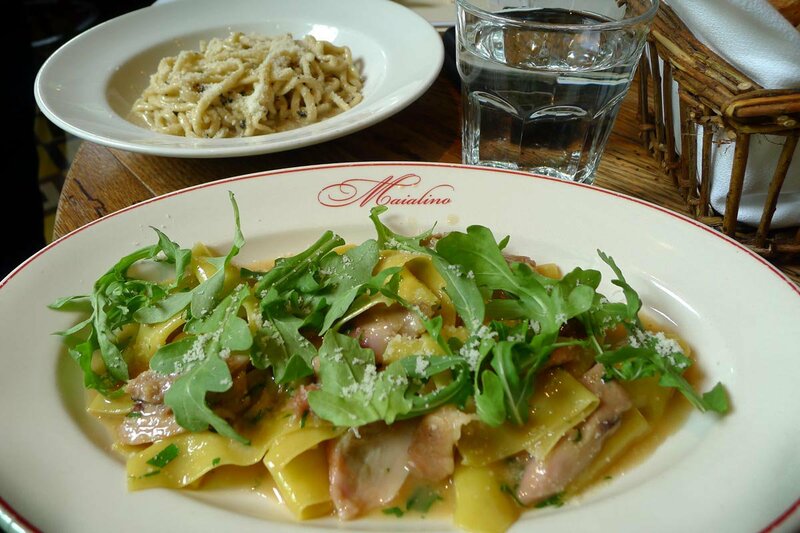 When he was at A Voce Madison Avenue, he served the first meal my husband and I ever ate together, which is only one reason I'd follow him anywhere for the sheep's milk ricotta on the menu at Locanda. George Mendes earned a Michelin star for his sophisticated Portuguese-inspired cuisine (and an unforgettable rice with duck confit) at , but his Portuguese tavern-inspired Lupulo is the one keeps drawing me back. I love the horseshoe bar setup, the open kitchen, the breezy atmosphere, the middle-of-nowhere Sixth Avenue location, and, most of all, the salt cod and potato casserole. It should feed two, but good luck getting me to share it. When I come home from Italy, I always crave pasta, and this is the place I always go. Chef Nick Anderer is about as Roman as a non-Roman can be, down to the off-the-menu sauce I like to order and the naughty, naughty porchetta. , his Roman pizzeria nearby, is another favorite. Of course, it goes without saying that any Danny Meyer dining room is a wonder to watch in action. Joey Campanaro may have taught me to like meatballs, but Daniel Holzman and Michael Chernow taught me to love them. I don't know how they can keep the food so good and the prices so low — and do it across so many locations — but I'm not complaining. There's a lot of talk about the vegetable revolution that we're living right now, and, as a former vegetarian, I'm both skeptical of it and delighted by it. Chef John Fraser strikes a perfect balance: What he can't do with a vegetable isn't worth doing, and, goddamn, does he have a way with ribeye and branzino. My wedding party was on the rooftop of the Standard East Hotel when it was the Cooper Square, so for silly personal reasons I want this building to have a restaurant I adore. Here's hoping Fraser stays a while, even as he expands his horizons with new developments like , the casual all-vegetable spot he just opened with former editor James Truman. If I wrote a paragraph about everything that happened every time I ate here, it would be the story of my life in New York City. It's the most reliably wonderful dining room in town, period. If money were no object, I'd have the omakase here several times a month. Alas, I'm not Midas, so I'll just treasure the memory of the dozens of exquisitely prepared and beautifully presented sushi courses I ate here for a long, long time to come. You know that restaurant that you forget you love so much? That's Red Cat for me. I spent my first decades in Manhattan living in the East Village and am still getting used to my Chelsea address. Spanish cuisine at the hands of Seamus Mullen is vibrant, hearty, deceptively healthy, and, if you're lucky, fresh off the wood-fired grill in the open kitchen. Chef Justin Smillie worked magic as the chef at Il Buco Alimentari, and he's doing the same here, delivering short ribs and pasta that consistently knock my socks off. Lately, my husband and I like to play a restaurant game. It's called "Where do you want to go for dinner?" Every time, we try to come up with a knee-jerk reaction that isn't "Vic's." Hillary Sterling's turnips with pesto is so good I order one for the table and one for me. Pizzas, pastas, meats: It's all fantastic.